The third annual Apple Day will take place on the Town Square from 9 until 3 (Helpers from 8am). The event is run by the Transition Town Group who will have the Community Apple Press in action pressing locally sourced apples and giving free tastings of the apple juice. There will be other stall holders and children’s activities. The apples will be collected and prepared on Friday 4th October from 1pm onwards at 27 Granville Street if you are able to help. For more information contact Gillian Baverstock on 01858 465653. 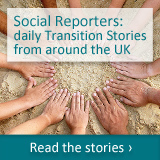 Our new website is up and running, same address www.transitionharborough.org.uk do have a look at our latest news. 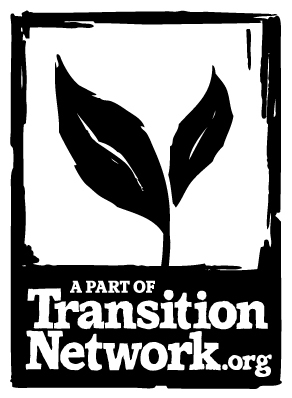 The 3rd edition of the national newspaper of the Transition Town Network is NOW available in Market Harborough ! It is very well produced and a really interesting read about positive sustainability stories from around the world. It costs £1 a copy and can be obtained from Mark Baverstock on 0758595 6612. The Seven Locks Housing environmentally-friendly Ecohome is a Sustainable Harborough Challenge Project supported by Transition Harborough. A family will very soon be moving in to the rented house that will be fitted with extra insulation, solar PV panels, low energy appliances and heating controls aimed at ease of use. The house will have open days during the year. It will also be one of a number of enviromentally-friendly home in the area that we hope to encourage to open to the public for a viewing day. Eat someone out of poverty —–how could you do that? —-and education is the key to getting out of poverty. Dead bees – don’t panic! Posted on September 2, 2013 by admin | Comments Off on Dead bees – don’t panic! While finding a pile of dead bumblebees under your Buddleia is a disturbing sight, at this time of year it is actually quite natural. So what exactly is going on? produce male offspring and new queen bumblebees. The males will leave the nest soon after they have grown and never return. Their primary role is to mate so they will spend their time in search of new queens from other nests. The new queens will leave the nest during the day to feed and mate but will return each night to the safety of the nest. Once the new queen has mated (an acrobatic process, which most queen bumblebees only do once – see photo) she will spend her time feeding in preparation for hibernation. Newly mated queens are the only members of the colony to hibernate over winter – more on this next month. Once the new queens have left the nest to hibernate, the rest of the colony will start to die. This includes the old queen, the female workers and the males. It is common to find the dead and dying bees near to flowers – when they are close to the end of their short lives, they become lethargic therefore their natural instinct is to feed on nectar. Comments Off on Dead bees – don’t panic!